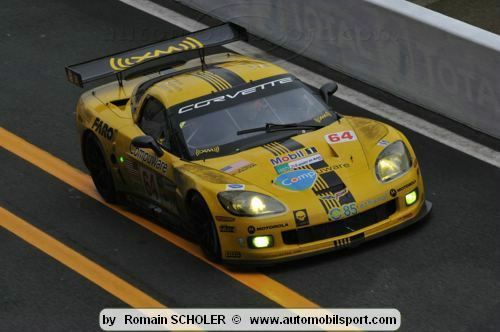 For the second consecutive year, Corvette Racing finished second in the GT1 class in the 24 Hours of Le Mans. Johnny O'Connell, Jan Magnussen and Ron Fellows completed 344 laps in their No. 63 Compuware Corvette C6.R, finishing on the lead lap with the winning No. 009 Aston Martin DBR9 of David Brabham, Antonio Garcia, and Darren Turner. The No. 64 Compuware Corvette C6.R driven by Oliver Gavin, Olivier Beretta and Max Papis finished third with 341 laps completed. The turning point came in the 17th hour when the Corvette Racing crew had to replace the No. 63 Corvette's right front brake pads. Although the work was finished in less than 90 seconds, the Aston Martin gained valuable track position. After scoring five wins in seven years, Corvette finished second to Aston Martin Racing for the second year. "Once again, we saw one of the epic battles in all of sports car racing," said Corvette Racing program manager Doug Fehan. "When you can take two cars, run them for 24 hours, and have them finish just minutes apart, it's an incredible achievement for both teams. We had a brake issue with the No. 63 Corvette and overcame a problem with the alternator in the No. 64 Corvette, and both cars finished on the podium. When we look at Corvette Racing's overall record and performance here at Le Mans, Chevrolet can be proud." "This has probably been the best we've been able to race for the entire distance," commented team manager Gary Pratt. "We had a good strategy to pick up a lap by running 14-lap fuel stints, but we got hung up by the safety car. In the night and in the rain, the Astons could pull away from us a little, and we couldn't seem to get it back. We started to catch up in the daylight, but then the rain returned. The Corvette Racing team worked hard, we never gave up, and we made it a close race." "The effort that Chevrolet and Corvette Racing put into this event is gigantic," said Johnny O'Connell. "Ninety-nine percent of teams would be ecstatic to finish second at Le Mans two years in a row, but we have high expectations and lofty goals at Corvette Racing. Had the weather not gone the way it did, with our strategy of going 14 laps on a fuel stint, the race might have gone our way. The spectators saw the two best teams in sports car racing go toe-to-toe today, and I'm very proud of the effort that everyone put forth." Corvette Racing's next event is the American Le Mans Northeast Grand Prix at Lime Rock Park in Lakeville, Conn., on July 12. Olivier Beretta, No. 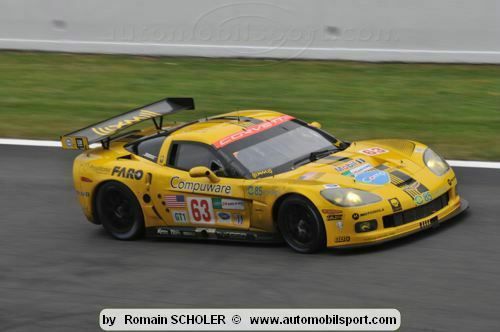 64 Corvette C6.R: "I'm already thinking about 2009 Le Mans. Everyone at Corvette Racing did a fantastic job preparing the cars. We just had bad luck on the No. 64 Corvette with the alternator and the safety car, and that was two laps gone. When it was raining, I pushed hard, I felt comfortable, and did four or five stints. At Le Mans, the last thing to do is to give up, so I just pushed and hoped that we would have better luck. It's a disappointment to finish second or third, so there is only one place to be – in first. We did that three years in a row with Corvette, I did it five times in my career, and I hope that the sixth one will come next year with Corvette Racing." Ron Fellows, No. 63 Corvette C6.R: "I felt that we had the opportunity to win this one. We were well prepared and both teams put up a hell of a fight – and we were second best today." Oliver Gavin, No. 64 Corvette C6.R: "This is a race that just sort of got away. I think we were fast enough and any one of the four cars from the Corvette and Aston Martin factory teams could have won today. It just came down to the one that had the cleaner race. We had bad luck with the alternator and then the floor issue. Maybe we were lacking some pace in the night, and got some unlucky breaks with the safety cars. It all adds up to the three laps that we were behind. That's Le Mans for you. We'll be back to fight them next year." Jan Magnussen, No. 63 Corvette C6.R: "Standing on the podium at Le Mans is special, but second is not exactly the spot we wanted. We hoped to improve on last year, and we had a nearly flawless race – but unfortunately, so did Aston Martin. In the night they had a little more speed than us, and it was tough to get back that gap. All of the guys worked so hard for this, they deserve a win. We'll just have to work even harder and get a victory next year." Max Papis, No. 64 Corvette C6.R: "You need a perfect race to win Le Mans against Aston Martin, and my hat's off to them. Sometimes you win or lose over a small detail, and that's what happened to us. We tried every Michelin tire, from rain to dry to intermediates. I felt that everyone did everything they could. It's great to be able to count on your teammates, to know that everyone who gets in the car will contribute. We came up a little short, but a podium finish at Le Mans is always something special.